The installed cost of solar photovoltaics (PV) has fallen rapidly in recent years and is expected to continue declining in the future. In this report, we focus on the potential for continued PV cost reductions in the residential market. From 2010 to 2017, the levelized cost of energy (LCOE) for residential PV declined from 52 cents per kilowatt-hour (¢/kWh) to 15.1 ¢/kWh (Fu et al. 2017). 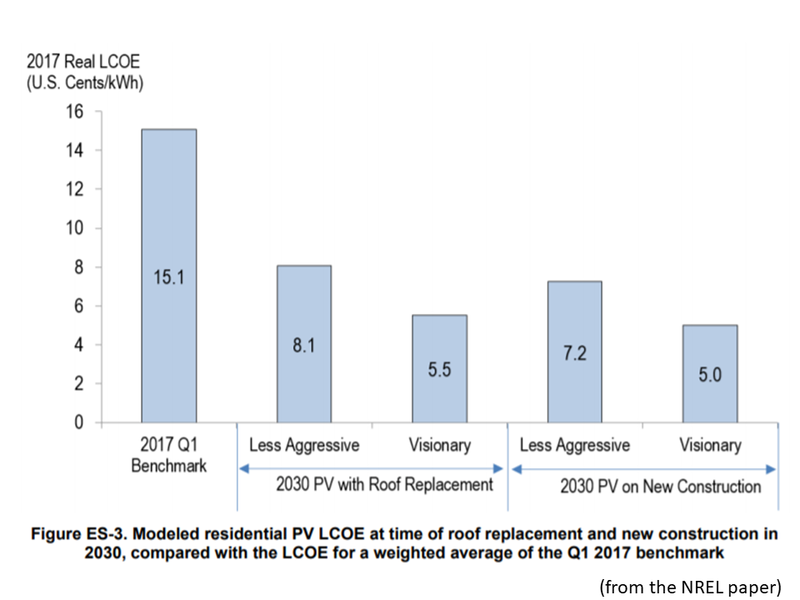 The U.S. Department of Energy’s (DOE’s) Solar Energy Technologies Office (SETO) recently set new LCOE targets for 2030, including a target of 5 ¢/kWh for residential PV. We present a roadmap for achieving the SETO 2030 residential PV target. 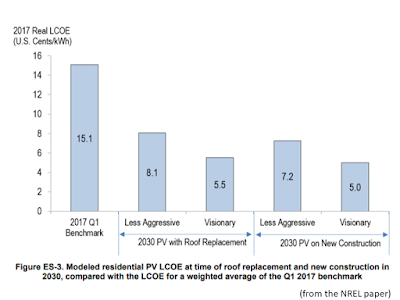 Because the 2030 target likely will not be achieved under business-as-usual trends (NREL 2017), we examine two key market segments that demonstrate significant opportunities for cost savings and market growth: installing PV at the time of roof replacement and installing PV as part of the new home construction process. We estimate that, between 2017 and 2030, an average of 3.3 million homes per year will be built or require roof replacement. This translates into a residential PV technical potential of roughly 30 gigawatts (GW) per year (Figure ES-1). Capturing even a relatively small fraction of this technical potential could have a significant impact on the evolution of the U.S. electricity system. Within both market segments, we identify four key cost-reduction opportunities: market maturation, business model integration, product innovation, and economies of scale. To assess the potential impact of these cost reductions, we compare modeled residential PV system prices in 2030 to the National Renewable Energy Laboratory’s (NREL’s) quarter one 2017 (Q1 2017) residential PV system price benchmark (Fu et al. 2017). We use a bottom-up accounting framework to model all component and project-development costs incurred when installing a PV system. 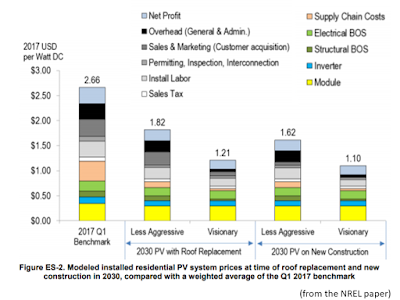 The result is a granular accounting for 11 direct and indirect costs associated with installing a residential PV system in 2030. It is unlikely that all PV installers in these two market segments will pursue the same costreduction strategies, so we model four pathways that could be pursued to achieve low-cost residential PV in 2030 (Table ES-1). The two less-aggressive pathways represent a more conservative shift from current technologies and business practices, whereas the two visionary pathways represent a higher level of innovation. We assume that market maturation and subsequent supply chain efficiencies will yield cost reductions across all four modeled pathways by 2030. All four modeled pathways demonstrate significant installed-system price savings over the Q1 2017 benchmark, with the visionary pathways yielding the greatest price benefits (Figure ES-2). The largest modeled cost savings are in the supply chain, sales and marketing, overhead, and installation labor cost categories. When we translate these installed-system costs into LCOE, we find that the less-aggressive pathways achieve significant cost reductions, but may not achieve the 2030 LCOE target (Figure ES-3). On the other hand, both visionary pathways could result in PV system prices that get very close to (for roof replacement) or achieve (for new construction) the 2030 target in each market segment. 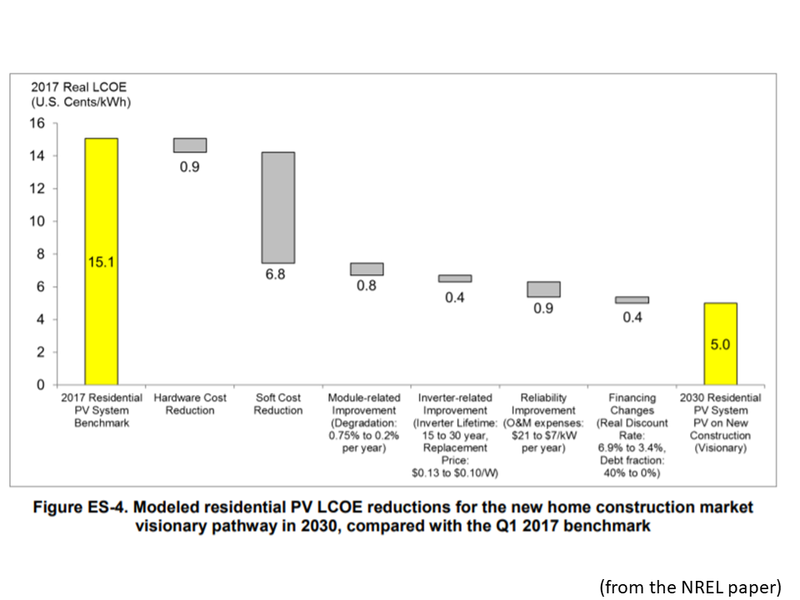 Figure ES-4 compares the LCOE impacts of our modeled installed-system cost reductions with the impacts of improvements in other parameters, for the new construction visionary pathway. The results indicate that savings associated with installed-system soft costs account for about 65% of the total savings. 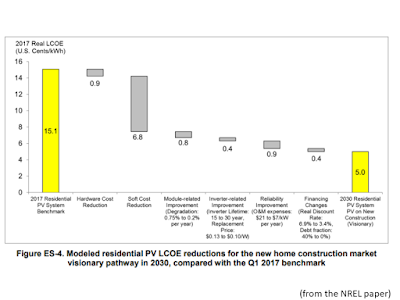 Therefore, reducing these soft costs likely will be critical for achieving the 2030 residential PV target. 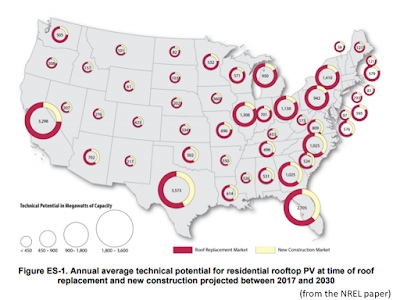 Although we identify pathways toward the 2030 residential PV target, various barriers and considerations must be addressed to realize this future. First, all four pathways benefit from anticipated market maturation that could significantly reduce supply chain costs. 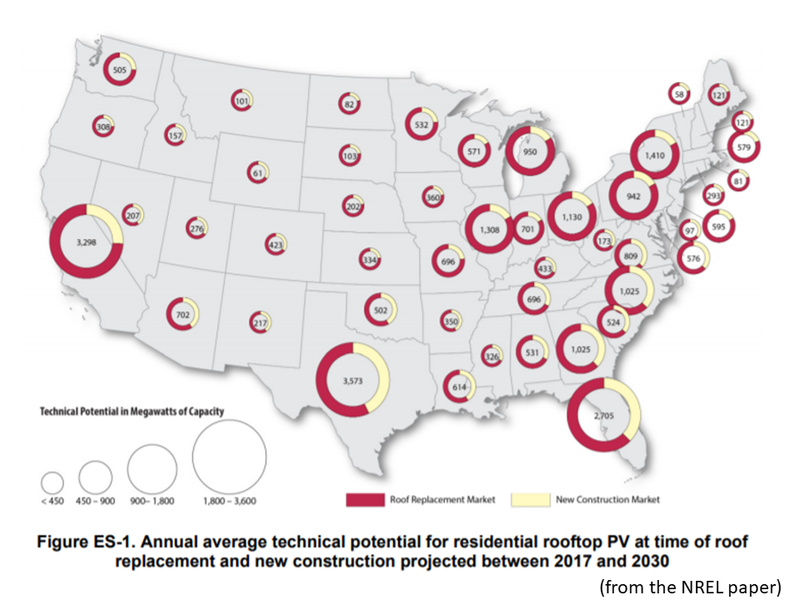 This analysis assumes that PV installers can procure modules at or near spot market prices in 2030. This future is likely to require significant innovation in business models as well as the proliferation of efficient procurement processes. Second, the two visionary pathways assume that a low-cost integrated PV and roofing product is available by 2030, which could significantly reduce supply chain, installation labor, and permitting costs. Although integrated PV products have been or are being developed, achieving low-cost residential PV with an integrated product is very challenging and will likely require significant investments in research and development. Third, business model integration could provide significant sales, marketing, overhead, and labor savings that reduce installed PV system prices. Although there have been efforts to collaborate across the solar and roofing industries—and across the solar and housing industries—fully integrating across these types of businesses will require significant changes to existing practices. In addition, regulatory challenges such as variation in PV permitting requirements across more than 18,000 authorities having jurisdiction across the United States could serve as another barrier to increasing business model integration. Fourth, economies of scale yield considerable cost savings, especially for the new construction market. However, the benefits of scale may be less than those assumed in our analysis, resulting from construction timelines, project sizes, and workforce management. In addition, those homebuilders that construct comparatively few homes (e.g., 20 or fewer homes annually), are unlikely to experience the same process efficiencies as those that construct hundreds of homes. In addition, potential permitting challenges and delays associated with deploying PV on new homes could result in additional costs that offset the savings benefits of economies of scale.